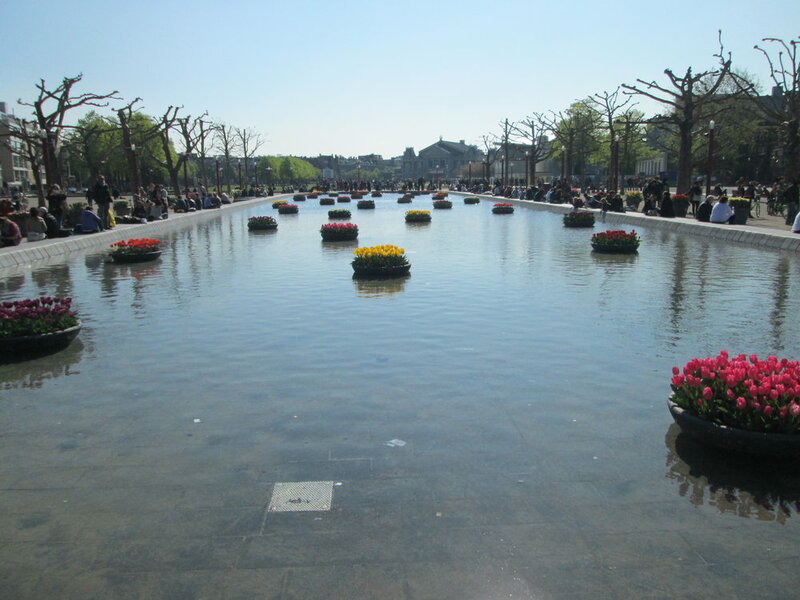 Rijksmuseum pond in the springtime! Filled with water and tulip planters. With only ten days left in Amsterdam, my abroad experience is coming to a close. I have spent the last month here, reveling in every experience that this city has to offer. Allow me to recap on a few of my best memories and subsequent musings. Pregaming Lib Day in the sun on the houseboat in front of my dorm! Westerpark Lib Day Festival! Classic bike shot. Another one of those underrated Dutch holidays, Liberation Day is celebrated every year on the 5th of May in the Netherlands, commemorating the end of the occupation by Nazi Germany during WWII. Unlike Kingsday, I hadn't heard about this holiday before coming abroad, most likely due to the fact that students take advantage of the long weekend to travel. Well, I was here, and I recommend everyone stay for this lively Dutch day. The city comes alive with multiple open-air festivals, both free and priced, catering to just about every musical preference you can think of. I personally attended two festivals, both free. The first part of the day, my friends and I spent at Westerpark, a huge park in the upper western corner just outside of city center. Here, there were 7-8 different little stages throughout the park playing an eclectic mix of music. We hit the park's famous food truck alley, people watched and then chilled on the grass, listening to some cool tunes in the sun. After leaving the Westerpark, we headed south to the Amstel River, where a massive concert was set to take place on the water. The Royal Family and various Netherlands officials were there, so you know it was a big deal. The musical menu took a turn for the classical, featuring mainly symphony and a cappella performances. Although not my genres of choice, it was cool to participate in the mainly Dutch audience and feel the strong sense of patriotism they share. All throughout the performance, little Dutch flags and red, blue and white balloons were passed throughout the crowd. It was tough to get a good picture from my (short) position in the crowd, but my blurry attempts give you the idea. Crowd at the Concert on the Amstel. Amazing floating stage and light setup for the Concert on the Amstel. Liberation Day was a fun and lighthearted day in the Netherlands, but its deeper implications resonated with me on a different level. Living in Europe for a semester has truly opened my eyes to the scar that World War II left on the face of Europe, affecting especially those countries whose citizens were persecuted. I haven't had one class this semester that hasn't drawn on the second World War as a source of influence as to how our world is today, both in Europe and in America. Obviously, because the war physically took place in Europe, it is remembered more vividly and holds a more relevant position in every day life here. However, it's eye-opening and a bit shocking how little I, and probably most people in the U.S., think about this world-altering tragedy that occurred truly not that long ago and the implications that has for our society. Yummy tasting at de Kas ("The Greenhouse"). On a lighter note, I have been taking advantage of my dwindling days here to check out more of the cuisine Amsterdam has to offer! One experience, sponsored by CIEE, involved biking out to the eastern side of town to check out a restaurant called de Kas (Dutch for "the greenhouse"). I am so picking up what this place is putting down; they are the picture of sustainable eating in that they grow the majority of their produce in the nursery/garden attached to their restaurant and their farm 20 minutes away. Brunch with Mama at the #1 Yelped place in Amsterdam, Gartine. They firmly support the "slow food movement" that is picking up speed in Amsterdam, which is, in short, a response to the "fast food boom" that most Millennials have grown up in. Fresh produce, sustainable animal products, fair trade and the utmost care in preparing food are the cornerstones of this movement, and I am just so into it. Hell yeah, we rented a beer bike. The Rage Crew: "Like, We Rage"
Among other ridiculous things my friends and I have done in Amsterdam, this is certainly among the top five. Yes, people, we rented a beer bike! And it was epic. We are not the self-proclaimed "Rage Crew" for no reason; our group of 13 outdrank the group of Germans that proceeded us. GERMANS! Basically, we rode this bad boy around town for two hours, consuming over 30 liters of beer and four bottles of champagne. The general public loved us, with strangers on the street pushing our bike up hills when necessary and clapping and cheering for us as we rode past. It may have had something to do with the spontaneous, but constant, stream of drinking justifications being shouted from our bike. For instance, "There's a huge dog in that window, DRIIIIINNNKKKK!!!!!" or when passing our favorite doner kebab place, "We love you Sefa, DRIIIINNKKKK!!!!" Pretty much everything about this city merits a celebratory drink. These three experiences certainly don't encompass all of my recent shenanigans. Sometimes, what happens in Amsterdam has to stay in Amsterdam. But what they do illustrate are a few of my very favorite things about my time abroad: cultural-historic understanding, mindfulness, and my little CIEE family. These are the things that Amsterdam gave me, and for them, I will look back on this city with the biggest heart full of love.